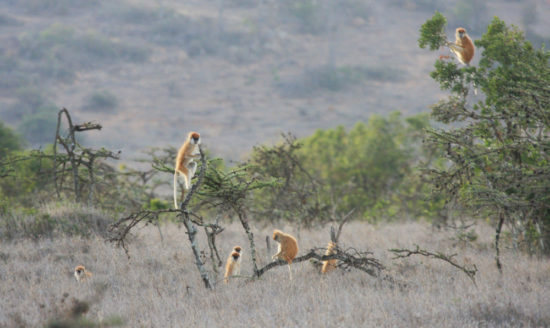 The results of the latest eastern patas monkey survey in eastern Laikipia (central Kenya) are now available. Read the abstract of the report below or go straight to the full report (De Jong & Butynski, 2017). The eastern patas monkey Erythrocebus patas pyrrhonotus is a subspecies whose abundance and geographic range are in decline. Laikipia County, central Kenya, supports a small, isolated, population which forms the stronghold and eastern limit of Kenya’s patas population. This report presents the results of the third survey of the abundance and distribution of patas in eastern Laikipia. Additional aims of this survey were to: (1) answer, or contribute towards answering, several questions important to primate conservation, both in eastern Laikipia and globally; (2) stimulate further interest in primate research and conservation in eastern Laikipia; (3) improve on the information available for the IUCN Red List assessments of the primate species and subspecies of eastern Laikipia; and (4) obtain information on the biogeography and taxonomic status of the region’s warthogs, dik-diks, and waterbucks. Eastern Patas Monkey Erythrocebus patas pyrrhonotus along the Ole Naishu Ranch – Borana Ranch border, eastern Laikipia. Photograph by Yvonne de Jong and Tom Butynski. The findings presented here are based on field surveys, questionnaires, and communications with long-term residents and property managers/owners. Eastern Laikipia appears to hold 145–155 patas. These occur in about 13 groups (mean group size = c. 12 individuals). Twenty of the 60 properties (33%) surveyed in eastern Laikipia County supported patas during 2010–2017. No property has more than two groups and most groups use at least two properties. Groups range in size from two to 25 individuals. There are at least four solitary patas (all probably adult males) in this region. 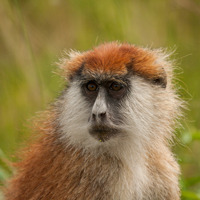 Adult male Eastern patas monkey Erythrocebus patas pyrrhonotus in Kidepo Valley National Park, north-east Uganda. Photograph by Yvonne de Jong and Tom Butynski. The extent of occurrence of patas in eastern Laikipia is c. 1,750 km². The north and northwest limit of the geographic range of patas in Laikipia is Loisaba Conservancy were solitary individuals (but no groups) are occasionally observed. Borana Conservancy represents the east and southeast limit. Central Solio Ranch is the south and southeast limit. The west and southwest limit may be ADC Mutara Ranch, but a survey of patas in western Laikipia County is required to confirm this. Comparisons with earlier studies show that the number of patas in eastern Laikipia has declined. This decline has occurred mainly through reduction in group size rather than through a reduction in the number of groups. Patas have been extirpated, or groups sizes reduced, in areas affect by habitat degradation, loss, and fragmentation, loss of perennial water sources, and severe competition with people and livestock over access to water. Habitat degradation, loss, and fragmentation are predominantly caused by over-grazing and over-browsing by livestock, conversion of large areas to agriculture, uncontrolled logging, charcoal production, high concentrations of savanna elephant Loxodonta africana, and spread of invasive plants, particularly prickly pears Opuntia spp. Damage is most severe in and around rural and communal areas—where the human population is most dense and where the extraction of natural resources is most intense and unsustainable. Bag of charcoal for sale along a road near Il Polei, central Laikipia County. Photograph by Yvonne de Jong & Tom Butynski. With the fast-growing human and livestock populations it is increasingly difficult for patas and other wildlife to find suitable habitat and to access water outside well-managed ranches. During the time of this study, eastern Laikipia experienced a drought and many, if not most, dams and rivers were dry for several months. In addition, pastoralist illegally brought very large numbers of livestock onto well-managed ranches for most of 2017. As a result, water on these ranches became difficult or impossible for patas and other wildlife to access. In order to assess the abundance and distribution of patas for all of Laikipia County, a survey in western Laikipia is needed. Recommendations for patas research and conservation action in Laikipia are provided in this report. 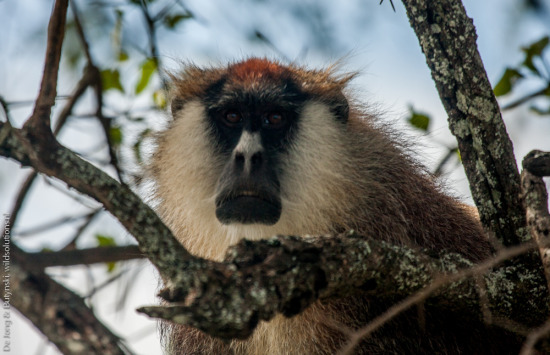 Fifty-nine groups of diurnal primates, belonging to four genera and four species, were encountered during this survey (olive baboon Papio anubis, Hilgert’s vervet monkey Chlorocebus pygerythrus hilgerti, Kolb’s monkey Cercopithecus mitis kolbi, Mount Kenya guereza colobus Colobus guereza kikuyuensis). 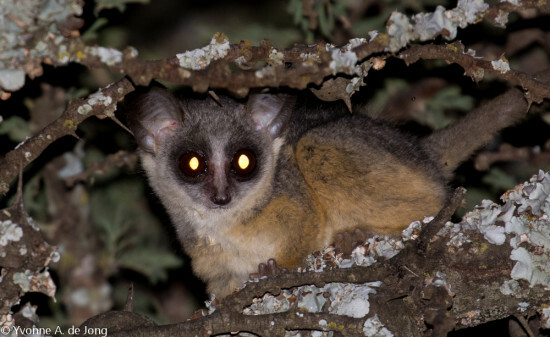 Only one species of nocturnal primate was observed— Kenya lesser galago Galago senegalensis braccatus. Somali lesser galago Galago gallarum was encountered in Samburu County during this survey. 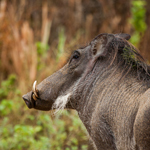 Both species of warthog Phacochoerus (common warthog Phacochoerus africanus and desert warthog Phacochoerus aethiopicus) and two species of dik-dik (Smith’s dik-dik Madoqua smithi and Kirk’s dik-dik Madoqua kirkii) were found in northeast Laikipia (Lekurruki Conservancy and Il ‘Ngwesi Conservancy). 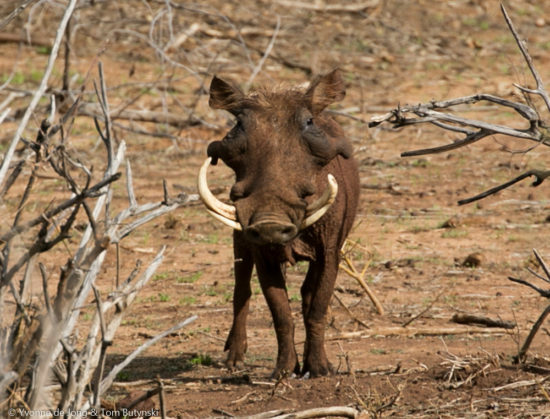 These are the first records of desert warthog and Kirk’s dik-dik for Laikipia County. During this survey, the geographic ranges of defassa waterbuck Kobis ellipsiprymnus defassa and of common waterbuck K. e. ellipsiprymnus in Laikipia, Isiolo, and Samburu Counties were better defined, as was their ‘hybrid zone’. Adult male desert warthog Phacochoerus aethiopicus, Lekurruki Conservancy, eastern Laikipia. Photograph by Yvonne de Jong & Tom Butynski.